If you’re fat, you’re sick? According to a recent campaign by an Australian weight loss company, “If you’re fat, you’re sick”. But just how fat do you need to be to get sick? The sweeping statement made by the character Dame Edna left a lot to the imagination. How fat? How sick? It certainly implied that being more than your ideal weight could lead to sickness and even an early demise. In clinical terms normal weight is defined by the Body Mass Index. (BMI). The adult BMI calculation is weight (kilos) divided by the square of his or her height (metres). For example a person who weighs 60 kg and stands 1.6 metres tall would have a BMI of 23.4, which is nicely within the “normal” BMI range of 18.5-25. However in most Asian countries, this crosses the line to be classed as “overweight”. What Jenny Craig and other’s who make money from peddling weight loss products don’t tell you is that it is more dangerous to be “underweight” (BMI of less than 18.5) than “overweight” (BMI of 25-30). A large peer reviewed study published in 2005 found that only those who were on the upper end of the obese scale AND those who were underweight had a decreased life expectancy in relation to their BMI. Underweight and obesity, particularly higher levels of obesity, were associated with increased mortality relative to the normal weight category. The JAMA study used data from over 36.000 participants in the US National Health and Nutrition Examination Survey (NHANES) to estimate the relative risks of mortality associated with different levels of BMI. The findings concluded that those classified as overweight did not have a significant increased risk of death. Statistically at least, those considered “overweight” in the study had a similar mortality to those who had a “normal” BMI. Despite these findings, the myth that being overweight (rather than obese) shortens life expectancy persists. However, it should be noted that the scope of the survey did not include quality of life or degree of medical intervention. As always there is research to the contrary. These days all medical studies need to be read with skill and a magnifying glass for the fine print. Those that tend to contradict the findings of the JAMA study largely involve fewer subjects, are not randomised and funded by the companies that may profit from the study’s outcomes. For example, recent conflicts of interest in medical research include funding from the fitness chain Curves and our friends at Jenny Craig. 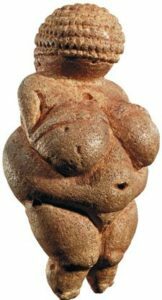 Venus of Willendorf: ancient ferdility goddess or the face of obesity? Sadly the company and their nutritionist did not respond to my, and others, requests on Twitter to back up their claim with credible research. However, the original ads don’t appear to be on the company website anymore. Perhaps they read some of the following reactions? Dr Samantha Thomas sheds light on the issue from both a personal and medical perspective at The Hoopla. Lady With Attitude on the Jenny Craig claims. Kassey Edwards in The Age. Can a crash diet cure type 2 diabetes? Is the environment making you fat?